WBandanahen the right people come together at the right time to do the right thing, then very little can go wrong. That was the general feeling at the first Asian Conference of Women’s Shelters, held in Taipei on September 3-5, 2012. 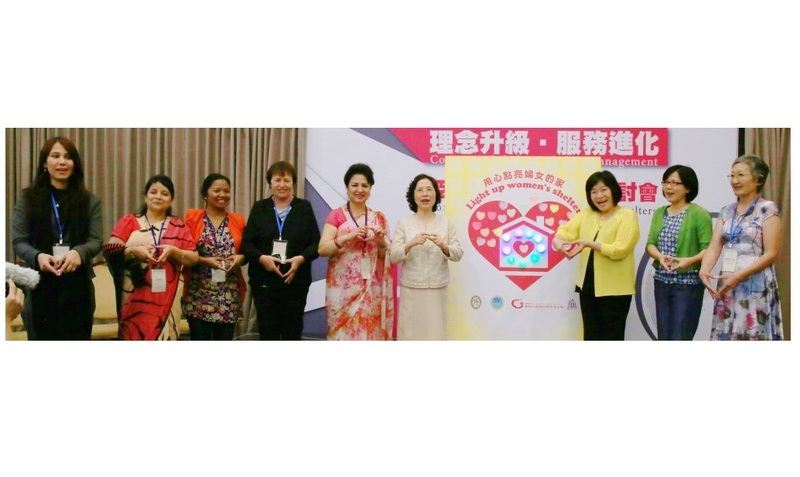 Jointly organized by the two main women’s shelter NGOs in Taiwan, the Garden of Hope Foundation and Good Shepherd Social Welfare Services, and sponsored by Taiwan’s Ministry of the Interior, Public Welfare Lottery, and Ministry of Foreign Affairs, the Conference was attended by 103 delegates from 14 countries around the region. The participants discussed building partnerships and strengthening services, law and policy-making, planning and organizational management, and strategies for advocacy and social change. On the third day of the Conference, the overseas delegates visited shelters run by the Garden of Hope and Good Shepherd in north Taiwan. As well as producing a high-level dialogue on how to end violence against women, a major outcome of the Conference was the formation of an Asian Network of Women’s Shelters. Despite the tight schedule of speeches and forums at the Conference, up to 30 representatives came together for two lunchtime meetings to draft the vision, values, purpose and objectives of the Asian Network of Women’s Shelters, and select its first steering committee. All this was accomplished in a remarkably short space of time. The vision of the Asian Network of Women’s Shelters is: “A just world in which communities and families live free from all forms of violence”; its values are: “Loving, warm, harmonious, equitable and inclusive families and societies; its purpose is to: “Unite, promote and strengthen the women’s shelter movement in Asia to end all forms of gender-based violence”; and its four objectives are: (1) platform creation, (2) capacity building, (3) advocacy, and (4) representation. The Steering Committee has six members, including representatives from each of the three sub-regions. Chi Hui-Jung, CEO of the Garden of Hope, Taiwan, is the chairperson; the joint Northeast Asian committee members are Sister Therese Thong, Executive Directress of Good Shepherd, Taiwan, and Endo Tomoko, Manager of the All Japan National Women’s Shelter Network; the joint Southeast Asia representatives are Sister Sutisa Utalun from the Congregation of Our Lady of Charity of the Good Shepherd, Thailand, and Wong Su Zane, Social Work Manager of the Women’s Aid Organization, Malaysia (pending confirmation); and the South Asian committee member is Bandana Rana, Executive Chair of Saathi Nepal and Chairperson of the Global Network of Women’s Shelters. The Network secretariat will be hosted by the Garden of Hope for the first year. During that time, the Network will work on its four main objectives to expand its platform by reaching out to other women’s shelter organizations, build the capacity of Asian women’s shelters by facilitating exchange programs and conferences, advocate for the rights of Asian women who are victims of violence, and build the governance structure of the Network so that it can represent the region globally and locally. The momentum to launch the Asian Network of Women’s Shelters started a little over six months ago, in February 2012, at the 2nd World Conference of Women’s Shelters in Washington DC, when over 50 representatives from Asian women’s shelters gathered at a regional roundtable. The good faith and goodwill built at that meeting helped set the stage for the formal foundation of the Network at the Asian Conference in Taipei. Bandana Rana Executive Chair of Saathi has been nominated in the board of Asian Women Shelters Network formed recently during the Asian conference in Taiwan from September 3-5. Bandana Rana is also the chair of the Global Network of Women Shelters.